Sussex Cricket have announced a new partnership with SEA LIFE Brighton for the upcoming Vitality Blast season. SEA LIFE - who currently have an offer on the back of all Sussex match day tickets offering a 50% off entry for up to five people at SEA LIFE Brighton - have agreed to sponsor the brand-new Family Stand situated in the North West corner of The 1st Central County Ground, next to the players’ net area. The SEA LIFE Family Stand will be in place for all seven home group matches and is for the dedicated use of families and will offer a different atmosphere from the other areas of the ground as the heart of the T20 FamZone. On match days, this area will be full of fun activities for all the family, including SEA LIFE run activities, face painting, balloon modelling and the ever popular BatFast cricket simulator, where you can test your batting skills against Sharks favourites Chris Jordan and Tymal Mills. Commenting on the partnership, Max Leviston, SEA LIFE Brighton general manager said: “SEA LIFE Brighton is delighted to have the opportunity to partner with Sussex Cricket and sponsor the brand-new SEA LIFE Family Stand for this summer’s Vitality Blast. 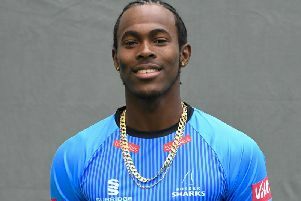 There is a natural synergy between an aquarium full of sharks and those that we come to watch in what is promising to be a thrilling summer of entertaining cricket. “As well as sponsorship, SEA LIFE Brighton hope to bring some great activities for the families in the FamZone to enjoy. We will have a dry touch area where we hope to bring awareness to some treasure that we find on our beaches such as sharks teeth, cuttlefish bones, ray eggs and other interesting artefacts and point out the obvious trash that is affecting our planet such as plastic and fishing line, and hopefully influence children to be world leaders in cleaning up the Sussex coastline.